The StoCoat Lotusan exterior coating possesses a highly water-repellent surface similar to that of the lotus leaf. Its microstructure has been modeled on the lotus plant to minimize the contact area for water and dirt. The surface additionally offers enhanced hydrophobic properties. With the commercial and residential building sector accounting for 39 per cent of CO2 emissions in the United States per year, building owners, occupants and the public are showing interest in building materials that are not only aesthetically pleasing but safe for the planet. Tech start-ups are partial to Green Building and all things environmental...and with good reason! Today’s technology companies — especially start-ups — are increasingly embracing the idea of sustainability. They are industry leaders when it comes to green buildings, green work spaces, and environmental stewardship. Established companies such as Apple, Google, Amazon and Facebook are already on the technology cutting edge so it seems like a natural fit that their offspring also support innovative, energy-efficient building technology. As Boss Magazine points out in a recent issue, the building industry should pay attention to this trend. The global tech market is expected to grow another 4% this year, making it a $3 trillion industry. Technology continues to be one of the fastest-growing sectors in the economy. Technology companies also lease a reported 42% of all the commercial square footage in the major metropolitan markets of North America. For comparison, that’s double the space leased by the financial industry. Going green is being driven by many factors in the tech company landscape. Millennial employees and consumers prefer green companies: Both are a target market for most technology companies. The Millennial generation is more environmentally aware; they are looking for business practices that reflect an awareness of climate change. A recent poll indicated that three out of four millennials are willing to pay more to do business with enterprises they perceive as championing sustainability whether it with be solar-powered data centers, urban roof gardens or recycled building materials. Saving money on energy costs: Early-stage tech companies are often strapped for cash; it behooves them to save on energy costs. Alternative energy sources, more efficient lights and appliances, can make a difference. For a start-up, amortizing an initial investment in energy efficiency can make for significant cash savings over time. Remodeling is trending: Prime commercial real estate is difficult to find in high-demand areas. Start-ups looking to lease a space, as well as giants like Amazon looking to expand, may consider recommissioning an older building versus buying or building a new one. It can sometimes be more economical to remodel and incorporate new, green, energy efficient systems into an older building. But not always! Buyer beware. Environmentally friendly practices: In addition to supporting green building and eco-friendly operations, many new tech companies also produce goods or offer services to help others become more environmentally conscientious. Many tech companies not only practice eco-friendly operations, but also produce goods or services that help others live a greener lifestyle. In fact, the demand for green building has driven growth in a new sector of tech startups – those focused on producing energy efficient systems and materials. Tax incentives: Tax credits and rebates, at both the federal and state levels, are also driving green building. Financial incentives for green upgrades such as loan programs with reduced rates, grants, and rebates, can help improve a growing company’s bottom line. Worker morale: Public health researchers have found that green-certified buildings improve employee decision-making and daily performance. One recent report indicated that people working in green buildings had 26 per cent higher cognitive function and 30 per cent fewer incidences of what’s come to be known as “sick building syndrome.” Healthy, happy employees are crucial for a company to thrive. Green building for rapidly-growing tech companies makes good sense on many fronts. A green, environmentally conscious start-up can attract high-caliber employees in a highly competitive market where young companies are vying for employees with tech giants. Using sustainable materials and reducing their carbon footprint also allows tech startups to resonate with new customers who are more environmentally minded. Most importantly, it also allows them to save money on recurring energy costs. And being profitable at the end of a start-up’s first year keeps investors happy! It’s not just a “best practice” for new companies. More and more businesses are embracing sustainable, green building. Leaders in the built environment – architects, developers, construction and building material companies — are increasingly committed to using sustainable materials and buying from manufacturers with eco-friendly practices. It’s all good news for Mother Earth! Passivehaus certification ensures a minimum of 90% in energy savings. 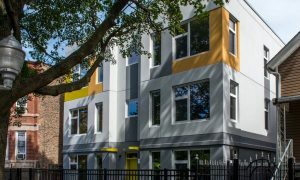 LUCHA, a leading affordable housing developer in Chicago, has just built the first multi-family Passive House in the state of Illinois. The landmark project in the Humboldt Park neighborhood has been certified by PHIUS — the Passivehaus Institute organization in the U.S. – with a projected energy savings of 90% over conventional construction. The Passivhaus Institut was established in Germany in 1996, to promote design, construction and insulation practices that make a building envelope more energy efficient and resilient. The goal was to construct walls and windows that are airtight – keeping warm air inside during the winter and cool air contained during the summer. In addition to an energy efficient building envelope, a “Passivehaus” building also incorporates advanced cooling and heating systems as part of the design. It encourages balanced heat- and moisture-recovery ventilation as well as solar utilization. While advanced technologies, appliances and systems such as climate-controlled zone programming are important for energy conservation, most building professionals agree that the building shell is the most critical component in achieving a zero-energy design. The Passivehaus organizations in the U.S. and in Germany both work to educate contractors and property developers about the PH standard and train companies on how to measure and certify buildings. While there are differences between the U.S. Green Building Council (USGBC), LEED (Leadership in Energy and Environmental Design) certification and PHIUS certification, the programs are aligned to encourage high energy-efficient performance in the built environment. Passive House certification also sets air quality and health standards and requires additional testing to ensure the standards are met. According to many industry experts, when it comes to green building and energy conservation, Passive House certification is rigorous, but the resulting construction delivers absolutely superior energy efficiency. The Passive House project in Chicago was designed by Landon Bone Baker, and the six-unit multi-family residence, is part of LUCHA’s Tierra Linda Project which will include other affordable housing units in the area. To capture energy efficiencies and ensure an effective air and moisture barrier, the contractor and architect for the Passive House complex chose StoTherm® ci with StoColor® Lotusan® for the building’s exterior cladding. Having worked with Sto in the past, they knew the Sto products would ensure they received the coveted PHIUS certification. The StoTherm® ci system integrates continuous insulation (ci) with air/moisture barriers and drainage, offering a wide range of textured finish options to create an aesthetically pleasing, sustainable wall cladding. This high-performance system not only saves energy but improves indoor comfort and air quality while maintaining maximum curb appeal and lowering overall life-cycle costs. StoColor® Lotusan® exterior coating was chosen due to its water- and dirt-repelling characteristics, and self-cleaning qualities derived from the organic structure of the lotus leaf. Sto Lotusan® enhances an exterior’s resistance to mold, mildew and algae with high water vapor permeability, and lowers maintenance costs by extending cleaning and re-coating cycles. Available in any color within the extensive StoColor System, Lotusan is UV-stable with excellent color retention. With Sto’s advanced building science and materials, LUCHA was able to secure the PHIUS energy-efficiency rating. They also created a multi-family complex with pleasing aesthetics that is impervious to the extreme weather conditions of the region. It is estimated that there are now more than 60,000 passive-house certified buildings worldwide with nearly 500 in Germany, and more elsewhere in Europe. And while there are only 46 PHIUS certified buildings in the U.S. today, there is a rising level of interest (especially in residential construction) in major metropolitan areas such as Chicago and New York. LUCHA is to be applauded for the organization’s commitment to Passive House building and the Tierra Linda project – a sustainably-oriented development that brings affordable housing with green technology to low-income residents of Chicago. In addition to improved heating and cooling efficiency – improving occupant comfort — this commitment will also help decrease energy costs for renters. Atlanta ranks #3 in the nation for green office buildings according to a recent study. The Georgia Tech Living Building in Atlanta, pictured here, will be one of most environmentally friendly buildings in the Southeast. According to a new study, Atlanta is one of the most environmentally friendly cities in the country when it comes to office buildings. The fourth annual Green Building Adoption Index – a study conducted by researchers at the Commercial Real Estate Services (CBRE) and Maastricht University in the Netherlands — showed that more than half (55%) of Atlanta’s office space is “green certified,” either through the USGBC LEED program or through Energy Star. Out of the 30 largest office markets in the United States, Atlanta ranks third on the list of eco-conscious office spaces, following San Francisco (#2) and Chicago (#1). Almost 25 percent of all offices in Atlanta are Energy Star labeled—second only to Manhattan and nearly double the national average. In 2015, the city of Atlanta adopted the commercial buildings energy efficiency ordinance requiring that commercial buildings spanning at least 25,000 square feet, must annually measure and publish their energy and water use. The goal is to see a 50 percent reduction in CO2 emissions from commercial buildings by the year 2030, according to Atlanta mayor Kasim Reed. Less than 5 percent of U.S. office buildings in 2005 were certified as “green” or “efficient,” researchers wrote. Since then, the statistic jumped to 38 percent. The CBRE study confirmed that institutional owners of office buildings continue to pursue green building certifications in the 30 largest U.S. markets. As the trend for green design and renovation continues, clearly, these top 30 cities nationwide are receptive target markets for all those in the sustainable, environmental building and design sectors. The Rio de Janeiro Museum of Tomorrow, designed by architect and engineer Santiago Calatrava, recently won the MIPIM award for “Best Innovative Green Building”. The stunning structure was recognized for its sustainable building design and architecture, as well as its “commitment to creating a better future”. Since the museum opened in 2015 for the Brazilian Olympics, it has become a symbol of urban recovery in the Puerto Maravilha neighborhood in Rio, providing the area with new infrastructure and transforming the neighborhood into an attractive destination. The building’s innovative and sustainable features include solar panels that move with the sun to maximize energy absorption, the collection of reusable rainwater, and an air conditioning system that uses water funneled from Guanabara Bay. This water is filtered, cleaned and returned to the Bay through a small waterfall. Water conservation efforts alone have saved an estimated 9.6 million liters of water and 2,400 megawatt-hours (MWh) of electricity each year ­– enough to supply over 1,200 homes. It is the first museum in Brazil to receive LEED Gold certification. Designed to be a place where science and technology meet art and culture, the Museum of Tomorrow attracted 1.4 million visitors in its first year of operation, far exceeding expectations. MIPIM (Le Marché International des Professionnels de l’Immobilier) is an international real estate conference and exhibition in Cannes, France every March, bringing together real estate professionals, property investors, architects and other industry leaders. The award is part of an international competition that MIPIM sponsors. The Orlando Magic's Amway Center in Florida is the first NBA arena to earn LEED Gold Certification. The U.S. Green Building Council has released its LEED in Motion: Venues report which showcases high impact LEED certification projects such as convention centers, sports venues, performing arts centers, and community centers, and their ability to transform their environmental, social and economic footprint. 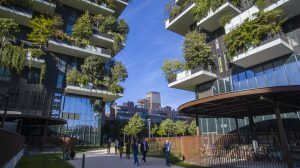 By incorporating green practices, venues around the world are positively impacting what the report calls the “triple bottom line” (people, planet, profit) while inspiring and educating others to be proactive in the areas of social responsibility and sustainability. The economic and environmental statistics in the report are also revealing. The anticipated growth in large convention, stadium, event venues and their impact on the U.S. economy are huge, to say nothing of the billions of dollars saved on energy, water, and maintenance if they are LEED certified.